2014 has been an important year for the Agency. 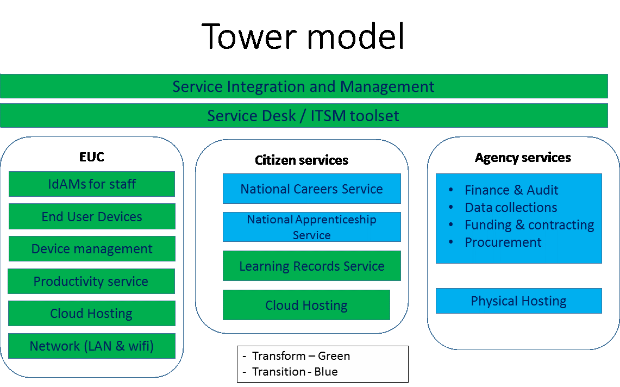 We've moved from a 'monolithic' supplier to a new tower model with Service Integration and Management (SIAM) and a Service desk running across the towers. The tower model moves organisations away from large IT contracts, handled by a single prime outsourcer, to a structure where the separate IT components – such as hosting, applications, network, security and desktop support – are contracted to different providers. Agency Services (Identity and access management for partners, Funding and Contracting, HR, Finance, Audit and Procurement). We’ve adopted an 'independent' SIAM model, which means that our SIAM partner is independent from the other service providers in the towers and therefore removing any risk of conflict of interest. The outcome of this change is that the majority of our contracts are now of shorter duration (2 years on G-cloud), giving us more flexibility to test the market for value for money (VFM) services and giving opportunities to Small and Medium Enterprises (SMEs) to work with us. We've embarked on a continual cycle of re-procuring our services and honing our service model whilst delivering efficiencies to the Agency. We went live with the new service model in November and are now into service stabilisation and improvement – assessing what works well, what needs to be changed, stopped or improved with our service model and suppliers.